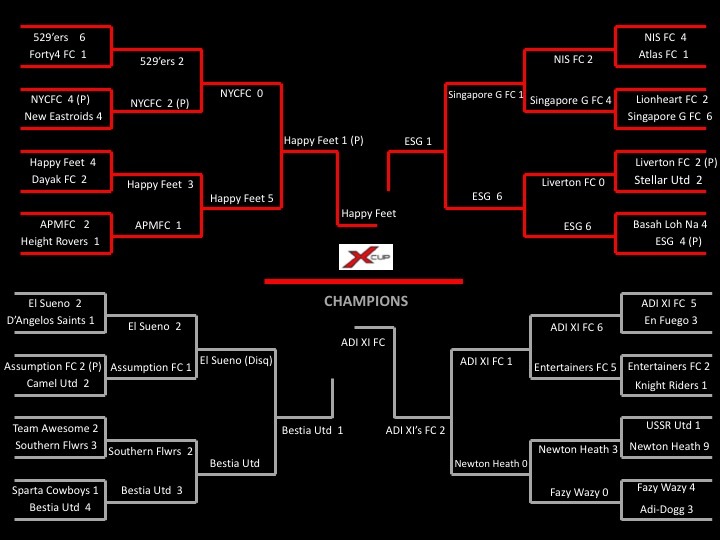 The match between Happy Feet and ESG at Bedok View Secondary was dubbed the “Clash of the Titans” and it didn’t disappoint. In what can only be described as a super high intensity game, one could have mistaken the fixture for a top of the table NFL clash. Tied at 1-1 at the end of normal time, the game went into a penalty shoot-out with Happy Feet emerging victorious. Over at Ang Mo Kio Secondary, ADI XI FC beat Bestia Utd in an evenly fought contest to book their place in the X-Cup Final. Since the game, ADI XI have gone on an unprecedented winning streak having scored an impressive 109 record breaking goals in the process. The final between Happy Feet and ADI XI will feature David taking on Goliath. Can Goliath prevail? Can Division 2 Champions ADI XI pull off an upset in the upcoming X-Cup final? Join us at Jalan Besar Stadium on 26th May 2018 @ 5.30pm. See you there! Week 3: Past Champions Disqualified! Shocking revelations in the Q-Final stage as defending X-Cup Champion’s El Sueno were disqualified from proceeding further in the competition when there were found guilty of fielding an ineligible player in their match against Bestia United. Happy Feet scored their biggest win in the competition when they ousted underdogs NYCFC in a game which didn’t necessarily reflect the score-line. After coming off an impressive win against 529’ers much was expected of NYCFC but the home side failed to capitalize on their chances and were made to pay a heavy price. Singapore G FC held favourites ESG to a 1-0 score line until they fell apart in the second half and eventually lost the game 6-1. This sets up a “Clash of the Titans” in the form of Happy Feet v ESG in the semi-finals. In the final Q-Final tie, ADI XI FC beat former X-Cup finalist, Newton Heath 1-0 in a game which neither side deserved to lose. After beating last season’s X-Cup finalist, Forty4 FC 6-1 in the first round, much was expected of 529’ers as they took on Sunday Premier Div 3 league leaders, NYCFC at Ang Mo Kio Secondary. To everyone’s amazement, the match ended 2-2 with NYCFC clinching victory through a gut wrenching penalty-shoot-out. NYCFC however have a daunting task ahead of them as they’re up against hot favourites Happy Feet in the Q-Finals. The Sunday league Div 1 table toppers disposed of APMFC 3-1, in their second round tie. Defending Champions, El Sueno also booked their spot in the Q-Finals when they scraped through their second successive game in the competition this time edging out Assumption FC 2-1 in a game which could have gone either way. Singapore G FC continued their fine run in campaign with an impressive 4-2 win over NIS FC while Bestia Utd edged out Southern Flowers 3-2 to book their place in the last eight. Singapore G will face the almighty ESG in the Q-Finals after the away side pulled off an impressive 6-0 win over Liverton FC at Mayflower Secondary. This promised to be an entertaining affair with the hosts going into the break only 1-0 down after missing a crucial one-on-one chance. ESG then pressed on in the second half and relied on their speedy counter attacks to seal the win. Newton Heath, who have scored 12 goals in in the first two rounds, will face ADI XI’s FC in the semi-finals after they beat Entertainers FC 6-5 in a game which Entertainers took a 4-0 lead. The luck of the draw saw Round 1 of the X-Cup 2017 feature teams that were considered potential title favourites facing each other in what one could only call the Group of death. Saturday Premier League Champions Basah Loh Na saw their hopes of qualifying dashed when they threw away a 4-2 lead to end the game tied 4-4 against ESG. Despite missing their first two penalties, ESG would go on to claim victory and seal their place in the second round. Another shocker in the first round saw two time X-Cup Champions, Height Rovers bow out of the competition when they were beaten by last season’s Sunday Premier League Div 1 Champions, APMFC. Other notable upsets included last season’s finalist Forty4 FC, crashing out of the competition with a shocking 6-1 defeat at the hands of 529’ers. Defending Champions El Sueno, suffered a scare in their tie against D’Angelos Saints as they were trailing 1-0 till the final 10 mins of the game. Over at Anderson Secondary, Newton Heath, who were the losing finalist in the very first X-Cup Final, score a shocking 9-1 win over USSR Utd. A very impressive score-line considering the Russians have never failed to go past the first round.